This Bengali cart stays true to the Kolkata fast food culture with its cheap and delicious rolls. Standing strategically outside Christ University, they feed crowds of students and employees everyday. 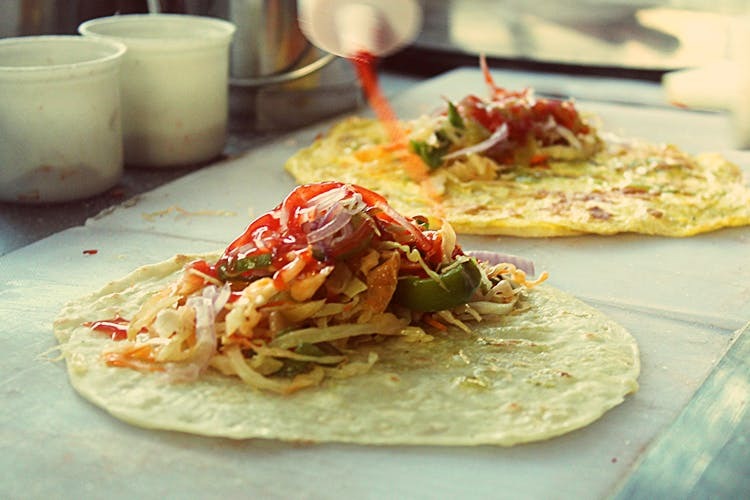 So head here to satisfy your street food cravings. On a normal day, at lunch time, one may not be able to find Super Rolls for their small stall is covered by the bodies of hungry students battling for their food. So if you’re looking for this cart you might want to watch out for the crowds too. They make vegetarian as well as non-vegetarian rolls and egg rolls for those stuck in the middle. And the best part is that its cheap, with prices ranging from INR 40 to INR 70. It’s a food cart, so don’t expect to find any seating here. They reach Christ University around 11am and begin their preparation while they leave when their food runs out and their customers start dwindling. They do not have fixed timings though, so it could change from day to day. Our favourite is their Chicken Hawaiian Roll, Paneer Hawaiian Roll and their Egg Chicken Rolls. We would say, the fried bits of potato that goes into these rolls are our favourite part. With fried onions, coleslaw, chilli and sweet sauce, egg and chicken, they come close to authentic Kolkata street kathi rolls. The best part is they also offer a Tiffin service for students staying around the area! How convenient is that? With their veg service costing around NIR 1,500 per month and the non-veg at INR 2,000 per month they provide meals at a decent price. They provide Their tiffin service includes good old home food like dal, subzi, roti and non-vegetarian options like chicken, prawn and fish. Avoid going there smack in the middle of lunch time if you want to skip the crowds. Noon to 2pm is intense! A good time to go is for an evening snack around 4pm as its not too crowded then.